So what’s a Beer and Tell? Mozilla Webdev recently started to have a monthly meeting (every third Friday of the month), where people show off their recent side projects, cool hacks, interesting pieces of code, etc., to the group. It’s sort of a lightning talks event where the speakers and audience consume their beverage of choice (for example, beer). This is why we call it “Beer and Tell”. We recently started recording this, so here’s the first video! Greg: Firefoxes, an application launcher to keep various versions of Firefox working in parallel, for OS X.
pmac: Scrumbugs, a visualization tool to help integrate Scrum with Bugzilla. Greg: The new Mozilla Webdev T-shirt, featuring a quine-esque design (i.e., if you ran the code on the shirt, it would render itself). tallOwen: SocialShare, a privacy-preserving way to place Facebook, Twitter, and G+ share buttons on your site. potch: YABU (Yet Another Bugzilla UI), a simple yet powerful way to search Mozilla’s Bugzilla. We hope you enjoyed our presentations and join us again for the next Beer and Tell! It’s sort of a lightning talks event where the speakers and audience consume their beverage of choice. This is why we call it “Beer and Tell”. Non sequitur. 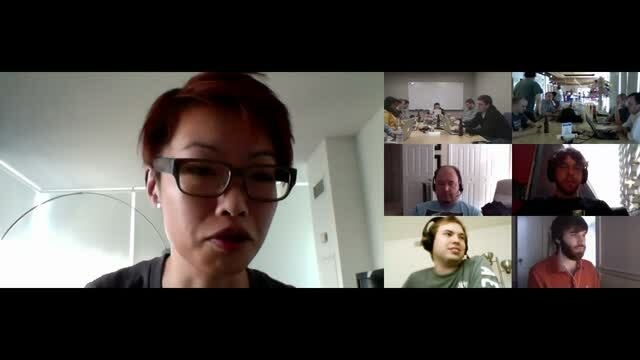 See recent Planet Mozilla discussion. Taryn: Not sure what exactly you’re referring to, but in case it is unobvious, the actual beverage is fully irrelevant to the event, and I believe I phrased it that way. Anyhow, I added a half-sentence to make that clearer. Fred is the former web development manager of Mozilla's Developer Ecosystem team. He likes to solve tricky problems, is an Open Source geek, and brings German Engineering to the webdev crowd. Fred spends his spare time on the hunt for great food and real Italian espresso.